Whataburger menu prices have always been especially low for the high quality of the Whataburger menu. That’s because, in 1950, entrepreneur Harmon Dobson set out to create a hamburger so big that you’d need two hands to hold it and so delicious that you’d exclaim, “What a burger!” with each bite. Dobson wanted each and every burger to be handmade to order while customers waited, giving them a fresh, fast, and affordable meal. With a plan like that, he really couldn’t go wrong, and now it’s been over 60 years since Dobson came up with the idea for the Whataburger chain of restaurants, which he started as a single burger stand in Corpus Christi, Texas. Today, there are over 750 Whataburger locations across the United States, and the restaurant chain is still family owned and operated. All of the burgers on the Whataburger menu are 100% pure beef, and they’re each served in a large, five-inch toasted bun. Not only that, but Whataburger hours are incredibly convenient for anyone’s schedule, as they’ll greet you with a smile and a warm, “Welcome to Whataburger!” twenty-four hours a day, seven days a week. 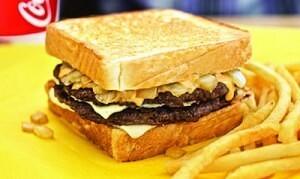 Though this successful chain has grown immensely and gained huge popularity all across the country, they maintain that, “The burger stand in Corpus Christi is never far from our hearts.” You’ll get the same warm, friendly, five-star treatment at any location anywhere in America that you would have gotten if you’d walked up to that little burger stand in 1950. And Whataburger menu prices have remained incredibly competitive, giving customers the ability to get a two-hand burger made to order when they order it with fresh ingredients at a low price that anyone can afford. And customers can now get more than just burgers from the Whataburger menu, too. If you’re in the mood for chicken, you can get the Whatachick’n® Sandwich, a grilled chicken sandwich, a chicken fajita taco, Whatachick’n® Strips, and more. Along with these and other all-time favorites like the Whataburger Patty Melt and the Green Chile Double, you can also get a Whataburger breakfast and desserts and snacks, too. In the mood for something sweet and adventurous? Try Whataburger’s latest invention, the root beer milkshake. It’s an old-fashioned favorite with a twist, and customers all over the country are raving about it. Whataburger makes one of the most sought-after hamburgers in America and 24-hour service, why not stop in to one of their locations today? Check out all of the low Whataburger menu prices below! See Full List of Fast Food Menu Prices!